← Is Russia’s Population Growing? Comparing Statistics: What is the true picture? A senior researcher at the Russian Academy of Sciences says he cannot survive on his monthly salary of $450. He has left Russia for a university in Japan. A family of four has purchased one-way tickets to Boulder, Colorado. They want to open a business and say the political and economic situation in Russia will not be resolved anytime soon. Fearing reprisal, prominent oppositionists like Garry Kasparov and economist Sergei Guriyev have announced their self-imposed exile. A poet says he is leaving because he cannot stand to see Putin on TV for the next decade—a common complaint. Pollution in metropolitan Moscow, foreign migrants, taxes, corruption, inflation—or stagflation, as the headlines scream—are some of the others. What are the people thinking? Watch how they vote with their feet. Although we are told that Russians stand solidly behind Putin in his aggressive actions toward territories that were formerly part of the USSR, some Russians are becoming alarmed by Putin’s bombastic approach. The takeover of Crimea, paired with the Kremlin’s renewed crackdown on independent media outlets and opposition politicians, has prompted some people in Russia to make plans to leave the country in pursuit of a better life abroad. … The emigration of members of the intellectual elite has been a persistent problem for post-Soviet Russia, and several high-profile liberal figures have left the country in recent years, including opposition leader and former chess champion Garry Kasparov and economist Sergei Guriyev. Russia also continues to rank among the top countries from which people flee seeking political asylum. Last month, the United Nations issued a report saying that Russia was the second leading country after Syria from which citizens ask for safe haven. According to the report, about 40,000 Russians asked for asylum in countries around the world in 2013, a 76 percent increase from the year before. 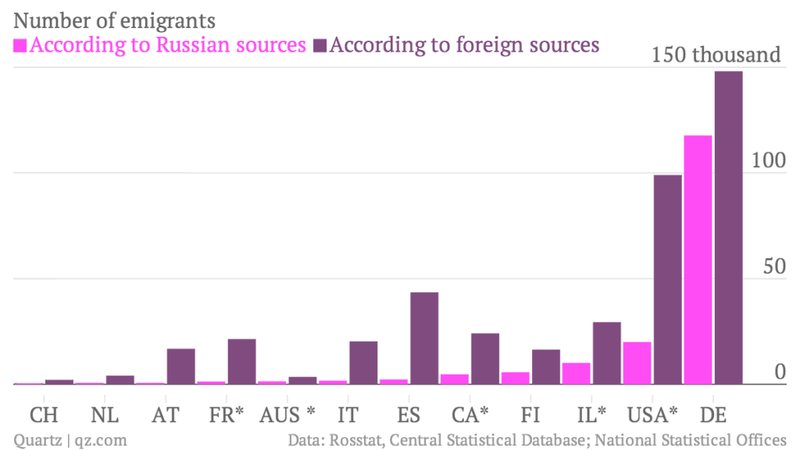 Germany and Poland were the most popular destinations for Russian asylum seekers. … All those interviewed by The Moscow Times expressed hope that some day Russia would abandon its policies that are increasingly isolating it from the West and become an equal part of the international community instead of frequently standing in opposition to other nations. But for now, they said, it was unacceptable for them to stay here. There is also Russia’s womb drain, the out-migration of hundreds of thousands of Russia’s fertile young women for marriage and various types of employment. Along with Russia’s high rates of abortion, this out-migration of fertile young women contributes to the ongoing low birth rates among ethnic Russians living in Russia. As the population of capable people declines, Russia will come to depend more and more on outside assistance. For those who still believe that Putin is providing Russians with good leadership, perhaps they should keep in mind that in the 14 years that Putin has controlled Russia, he has made the country more and more dependent on energy exports — neglecting the important diversification of Russia’s economy. Russia’s precarious dependency on the price of oil & gas — and on its customers’ continuing demand for Russian oil & gas — smells of short-sighted planning and corrupt opportunism. Imagine the problems in Putin’s Russia should oil prices drop 10% to 20% for more than a few weeks. One cannot evaluate the state of the world without considering the state of Russia. While every country has its serious problems, Russia’s problems are of the sort that cause large numbers of its best and most fertile people to move abroad. This is a serious problem for Russia which cannot be solved through denial or through changing the subject. This entry was posted in Brain Drain, Demographics, Russia and tagged Russian Collapse. Bookmark the permalink. I do not deny the problem afflicting Russia but there are problems, big problems, witht he West. And where Russia’s problems could be already fully blowed up, ours are not. Russia and China are amassing gold where central banks and people in the West is amassing paper money and paper claim of wealth. When the fiat paper money scheme will crumble we could find ourselves in the same situation of old USSR. Unable to pay for the weak and the old. Unable to pay for our houses and food. The US is living on stuff bough with paper money. When they will not want the paper, they will gave it back to you and will buy everything not nailed down. Then the US will experience what the people in the ’70s experienced. But on a much larger scale. There is only one salvation. Individual salvation. Nothing else. It’s unlikely that the most fertile Russians are moving abroad. People that are more mobile, more educated, and more motivated by money tend to be less fertile. Remember that when evaluating demographic position, emigration doesn’t tell us anything. A population with a strong demographic position can have high rates of emigration. The fact that the liberal opposition filth, supported by non-starters like Kasparov, are leaving the country is a boost to Russia’s demographics and overall population composition, as they will not trouble Russia with their fifth column activity and with their US state department funded subversion or with the parasitic and dysgenic existence anymore, since the morally and financially bankrupt, degenerate and pervert empire of the West is a far more suitable environment for them. No one can turn a nation that has collapsed and than been looted by outside interests completely around in a matter of a decade or so. Not even Putin who at least unlike the leaders in a lot of places is trying. Also re: diversification. Its a good idea but its not as easy as you might think. There is a global production glut and a global consumption deficit caused basically as far as I can see it lack of demand for labor and wage arbitrage. The few markets that might be out there are either closed for political reasons, highly merchantilist (like China) or insanely poor as in Africa. Under these terms the world can’t really support the level of production it has now. You also can’t take a low trust culture like Russia and suddenly expect high order operations and Sweden 2.0 People, Russian people don’t work that way and it will take entirely different efforts such as the reinvigoration of the church Putin is pushing to build a better functioning society. It will also take decades to bear much fruit. Russia may not have the time but in truth no one really does, All folks are doing is moving around a boiling kettle to as slightly cooler spot. everywhere with stability is humped. Europe right now is crowded with a great many people per square foot and this may well be contributing to lower birth rates. Also come on, Europe and Russia and other places are teeming with poor people who at best have the dole. They aren’t going to be having kids as they can’t afford them. Unfortunately the elite either can’t poor won’t grok this fact, people all over the world save for the least capable are increasingly less willing to have Favella babies mainly for the benefit of the elite. Even Brazil is down to European fertility levels as is Iran. They want a good life relative to the society or world they live in and are getting to understand that baby = poverty. This is a fine thing and for such societies as long as foreigners can be kept out the inevitable decline will have the effect of actually increasing the quality of life as land and space will become cheaper. The key I think to a reversal for the East and West is reliable income and social changes allowing for increased status for having children. Those however are far easier said than done as it would require changes in the social matrix away from the current system to more traditional ones (i.e to Patriarchy and Tradition) and away from the current economy to more economic nationalist zero sum goals. I’m not sure that’s even possible with the current technology. Yes. I understand what you are saying. Unfortunately for Russia, its current problems began long before the 1990s. And rather than getting better, they are getting worse. But as long as a corrupt kleptocracy holds tight control over Russian media sources, and continues to channel propaganda through western outlets such as RT, Mark Adomanis, etc., most observers will never have reliable information on which they can form a valid judgment. We are seeing the buildup to a potentially violent and cataclysmic end of Russia’s grand dreams of empire. It is possible to draw broad parallels between Russia’s problems and problems in the rest of the world. But in many ways, Russia is unique, and is likely to provide an object lesson in the future of the negative consequences of trying to hold onto dreams of empire, long after the heart of the empire has died. Aye. I don think anyone can afford an empire these days. I have a sneaking suspicion that any but the most homogeneous polities are too big for good governance these days. The problem is exactly as you say, violence. Its hard to right size counties without either the establishment resorting to totalitarianism and violence, them being looted by rapacious globalists and/or local kleptocrats, civil and or ethnic warfare or some would be empire builder deciding to take a chunk of land. Even the US is creaking that way. It too is a nation with a very uncertain future, I think we’ll be he next Brazil in the 80’s if we survive intact and that’s a big fall from say the US who put men on the moon. Now on Russia I can understand why Putin is doing what he is doing and even admire it to a degree but I agree with you, it won’t fix the underlying problems one notch, the new citizens aren’t going to be massively more fertile or more productive and trying to revivify the USSR if that’s the dream is folly. Of course as always, power is the hardest addiction to lick.